Producer – C. Lakshmi Rajyam under Rajyam Pictures. Singers – P. Leela, Jikki, Pithapuram Nageswara Rao. Ramaiah (NTR) is a horse-cart driver and his wife Lakshmi (Lakshmi Rajyam) works as a maid at the house of a wealthy man, Badrinath (S.V. 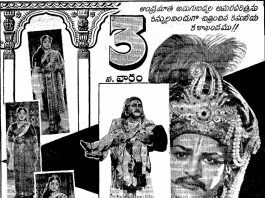 Rangarao). The couple has a son, Subbadu. Badrinath, who is issueless, decides to remarry to have children and is in search of a bride. His wife Parvathamma (Santhakumari) is advised by her elder brother Ramarao (Srivatsa) to fake pregnancy. She reluctantly agrees. As Lakshmi is pregnant again, Ramarao’s idea is to show her baby as that of Parvathamma’s to Badrinath and dissuade him from a second marriage. Ramaiah suspects infidelity on the part of Lakshmi and sends her out of the house. She takes shelter in Parvathamma’s house, delivers a baby girl and is shocked to find Parvathamma and the baby missing from there. Ramaiah remarries Durgi (Kanakam), who elopes with a stage actor after throwing her step son Subbadu into a stream. 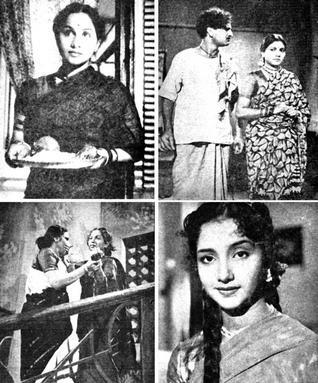 Dejected Lakshmi, who decides to end her life by jumping into the stream, finds her son and saves him with the help of a doctor (Dr. Damodaram). After Durgi leaves him, Ramaiah turns a sanyasi. Years go by. Lakshmi’s daughter Kamala (Vasantha), who is being brought up by Paravathamma, is now a young woman and is in love with Ramarao’s son, Premnath (Janardanam). 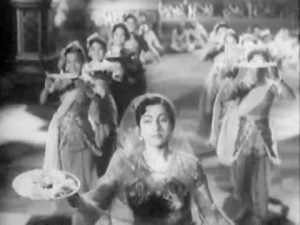 But Premnath’s mother, who knows the truth, objects to her son marrying a maid’s daughter. Subbadu is now Subbarao (K.S. Chalam), a lawyer of repute. After the story takes a few more turns and twists from here on all ends up well. Ramaiah returns home and the family is reunited.